Dmae and Susannah Mars of Artslandia talk with actress, comedienne and activist Margaret Cho. She’s back in Portland and headlining at the Helium Club on Thurs., Aug. 30th at 8 p.m., Fri., Aug. 31st and Sat., Sept.1st at 7:30 & 10 p.m. and Sun., Sept. 2nd at 7:30p.m. Find out more at margaretcho.com. 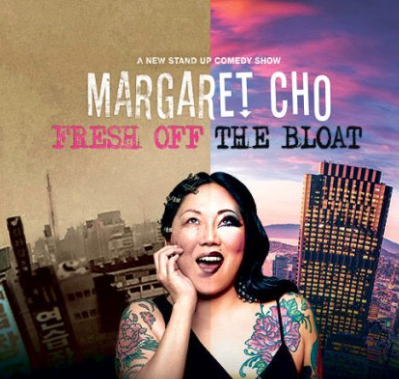 We’ll ask her about her “Fresh Off The Bloat” tour, what it’s like to do comedy since the 2016 and her new ventures into the beauty industry for Asian women. And we’ll catch up with Susannah and Dmae. BIO: Margaret Cho is an American stand-up comedian, actress, fashion designer, author, and singer-songwriter. Cho is best known for her stand-up routines, through which she critiques social and political problems, especially regarding race and sexuality. She rose to prominence after creating and starring in the ABC sitcom All-American Girl (1994–95), and became an established stand-up comic in the subsequent years. She has also had endeavors in fashion and music, and has her own clothing line. Cho has also frequently supported LGBTQI rights and has won awards for her humanitarian efforts on behalf of women, Asian Americans, and the LGBTQI community. As an actress, she has acted in such roles as Charlene Lee in It’s My Party and John Travolta’s FBI colleague in the action movie Face/Off. Cho was part of the cast of the TV series Drop Dead Diva on Lifetime Television, in which she appeared as Teri Lee, a paralegal assistant. In 2012 she was nominated for an Emmy Award for her guest starring role as Dictator Kim Jong-il on 30 Rock.